Valerie Endres has been a member of the Board of Trustees for more than 15 years. Her specialty has been membership events, including Barn Day, Creek Day, and Family Day on the Bob Jones Trail. Growing up in Westchester County, New York, Valerie lived in a house that overlooked a property that was being held by the county for a future highway. Because of timing and funding difficulties, the highway was never built, and the land finally became a permanent swath of open space, a valuable community separator and peaceful hiking path. Valerie is delighted that the land trust movement takes a pro-active stance to create similar green spaces throughout the country without waiting for highways not to happen. 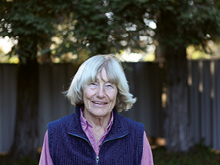 Valerie has lived in San Luis Obispo since 1969 and is a member of the Sierra Club, the League of Women Voters, the Central Coast Recorder Society, and the San Luis Obispo Association of Realtors. She is a past president of the San Luis Obispo Mozart Festival, has chaired the city’s Planning Commission and was involved with youth activities in the community for many years. She enjoys gardening, reading, traveling and skiing and hikes Cerro San Luis or Bishop’s Peak at least twice a week. She lives with her husband Leland in the Old Town neighborhood of San Luis Obispo.